It's not every day one finds an ale brewed with Sauvignon blanc grape juice or with grapes at all... because that's wine stuff! 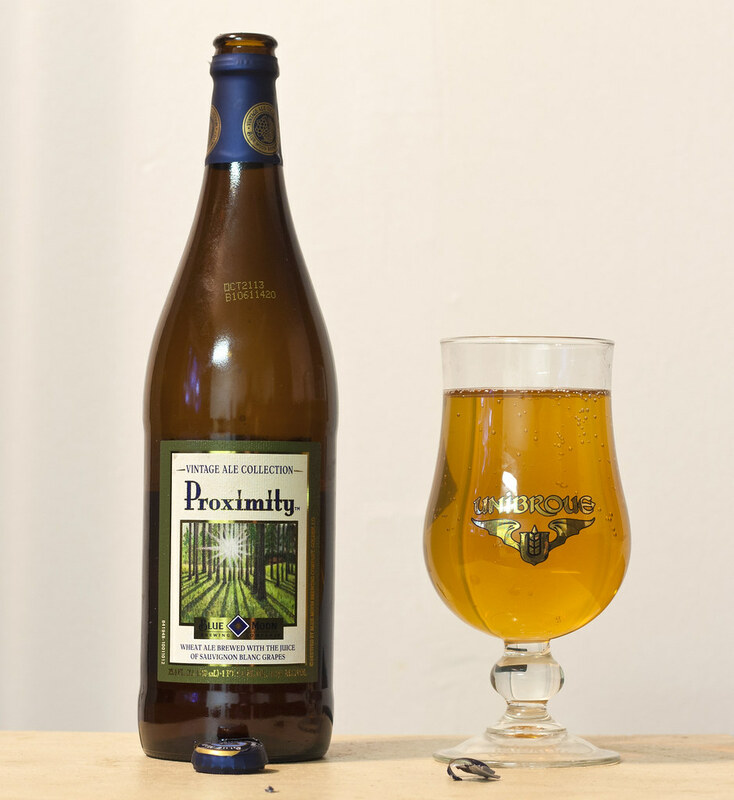 But the folks over at MolsonCoors' Blue Moon Brewing created just that, a wheat ale brewed with the juice of Sauvignon grapes for their limited edition beer, Proximity. I don't consider myself a snob, so when I'm down in the States for a mini vacation, I sometimes pick up a case of Sam Adams or Blue Moon. In this case, when I saw the bottle, I just had to pick it up. At first glance, I thought this was a wine and frankly, I'm not a wine fan. But then I noticed it was in the beer section of the store. So of course, I picked up a bottle to try. Unfortunately for me, as a beer hoarder, I aged this one way past its best before date. I buy a lot of beer, drink a lot of beer, but also hoard beer because I'm waiting for the right timing. Appearance: Proximity pours a clear golden straw yellow, somewhat fizzy and carbonated and a light snow wheat head that diminishes quite quickly. Aroma: Certainly has some white wine and Sauvignon notes to it. Hint of tartness, pretty faint and a bit of a scent of stale straw in it. The stale straw is probably my fault, but I'll blame Blue Moon! I like the Sauvignon aroma to it, it's nowhere near as strong and tart as in a wine, but in this beer, it gives it a nice aromatic profile to it. Taste: Very much a wheat ale that is trying to be a white wine. It has the standard characteristics of a filtered pale wheat ale, some citrus notes, quite grassy and light bitterness from the hops. Then there's the Sauvignon appearance that gives it the typical tartness of a white wine, a bit of an acidic mouth feel and quite dry, some flavours reminiscent of 7-up - citrusy. Quite easy to drink, and not bad at all. Sweet, very much a beer and notes of wine juice. Overall Thoughts: Smooth, not bad wheat ale with a decent amount of wine flavours in there. Quite a bit new to me as I've maybe only ever had two other beers that used grapes, and even then - it was more juice-like than wine. It was pricey at $10/750mL bottle, but incredibly smooth for 8.5% (and only 2-4 IBUs). I'd sure buy it again, but not at $10.